Firstly wash and minse the chicken and add salt, 1/2 tsp Kashmiri red chilli powder and juice of 1/2 lemon and mix well. Set aside in a refrigerator to marinate for 15 minutes. Mix together yogurt, garlic paste, ginger paste, salt, 1/2 teaspoon Kashmiri red chilli powder, garam masala powder and mustard oil in a bowl. Halve the burger buns horizontally. Cut onion into thick roundels. Put some butter on a heated griller and place the onion roundels on it and grill till lightly browned. Mix together mayonnaise and grated carrots in a small bowl. Remove onion from the griller and place in a bowl. 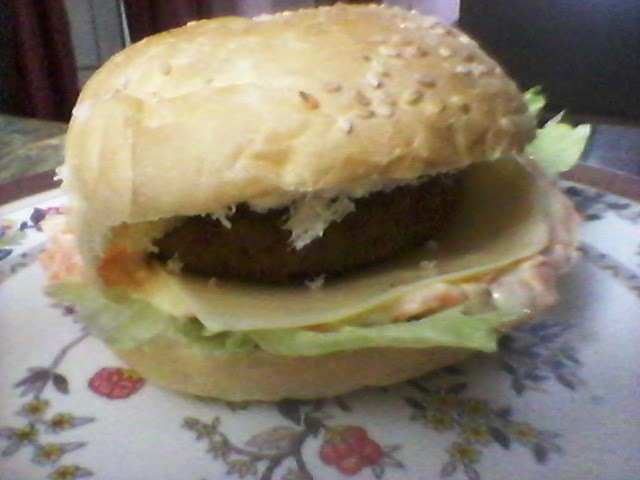 Apply mayonnaise-carrot over all the burger halves and place the square shaped cheese over it . Tear a few lettuce leaves and place over the bottom halves. Arrange the chicken fried and cooked over the lettuce and place the onion roundels over them. Cover with the top halves of the burgers and press lightly.